New bus services are using data from user's smartphones to predict where riders are, and where they want to go. Think of it as Uber for mass transit. New bus services are using data from user's smartphones to predict where riders are, and where they want to go. They aim to get commuters to their destinations faster, and more comfortably, than public transportation can for just a few dollars more. Boston's Bridj bus service and and Chicago's BlackLine service both launched this spring. The start-ups say they're combining data from public transportation systems, users' smartphones and GPS devices on board their buses to determine where to add or cancel routes on a day-to-day basis, and even to avoid traffic snarls. The buses also offer reserved seats, WiFi and express service. A ride that costs about $2.50 on Boston's T transit system costs about $5 via Bridj. Bridj is in "beta" now, so tickets are free, but it says that so far "thousands" of users have signed up for the service. 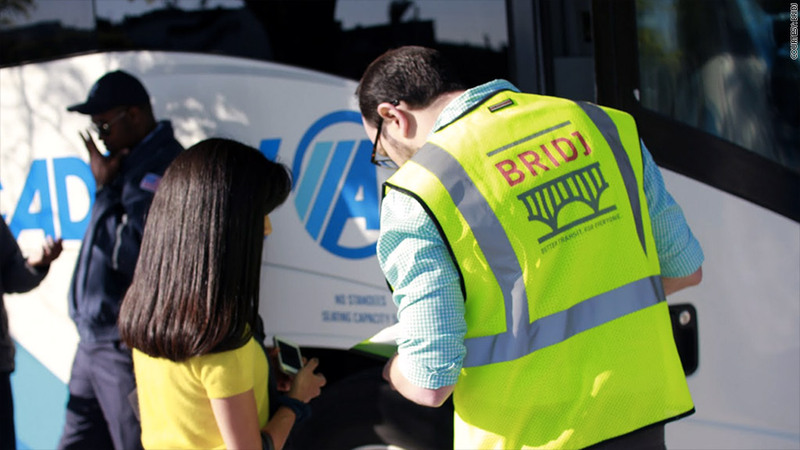 "We're essentially reinventing your commute," said Ryan Kelly, marketing manager at Bridj. But Bridj's success will depend on whether its service becomes popular enough to get a critical mass of commuter data. Sarah Baston, who has used Bridj since it began operating at the beginning of June, says the company's routes are already a big improvement on her old commute from Brookline, Mass. to her job in Cambridge. Related story: Uber CEO: "Our growth is unprecedented"
It used to take Baston 50 minutes to get to work via train and then a bus. Now she can get into the office in 20 minutes. "It was a need in the city," she says. "It's unbelievable how much better my commute is." A similar demand-driven bus service called Leap Transit is coming to San Francisco soon. Still it's doubtful these upstarts will put public transportation out of business any time soon. Baston says her daily bus is only half full. Boston's public transportation authority, meanwhile, serves 1.3 million people each day. And while both companies say they've secured the proper licenses and insurance, some cities may resist opening up public transportation to competition from private business. As Uber knows, struggling with local regulations can mean a bumpy ride for a new transportation service. Still, Kelly of Bridj says the company has big ambitions to carve out a market position between cramped-but-cheap public buses and more expensive and comfortable rides from taxis and Uber. "Within a year we want to be national," Kelly said, "but we'll be in another city very soon."